​We now own twice as many homes as we did last week! (And our bank account looks a lot sadder.) We closed on our new place Friday morning. After the closing we went and walked through the whole place again... my brain is exploding with house project ideas! Now I just have to find the time (and money) for them! Regarding our current home, do you want the good news or the bad news first? The bad news is, our original buyer backed out after we declined some of her unreasonable requests from the home inspection. The good news is, we were only back on the market for a few days before we received another offer. We are in the process of inspections again with that buyer, so fingers crossed that we can come to an agreement. In other non-house related news, we saw the musical "Waitress" last weekend, which we thoroughly enjoyed. Our friends Joey and Lisa came over to watch Mae, and they all had fun eating pizza and watching Moana together. We are definitely feeling some cabin fever since the frigid temperatures have kept us bundled inside. I have started running regularly again and am enjoying the cooler days but not the below-freezing temps and icy sidewalks. 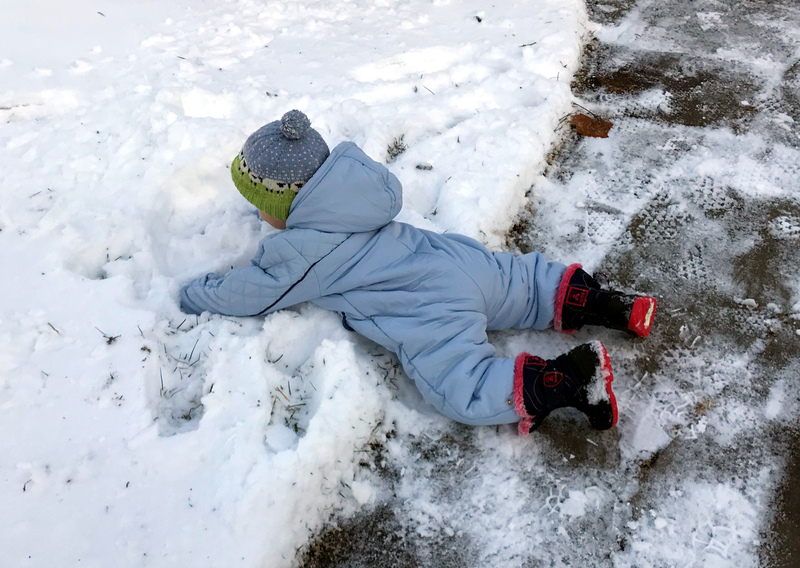 Mae, however, is fully immersing herself (literally) in the wintry weather. I completed another mom-milestone: surviving Mae's first real stomach bug, which was super gross. I am absurdly proud of how well I handled it. Considering I didn't burst into tears or faint, I definitely exceeded my own expectations. Lastly, some exciting news that Mom has completed her radiation treatments! Keep up your prayers for her continued health and recovery!